Ventana Research defines workforce management as the set of activities and processes organizations use to manage their hourly and salaried workforce for maximal productivity. It involves not only tracking and paying for time worked but also aligning that work to the tasks and objectives of the organization. Workforce management is a critical component of every company’s human resources and human capital management processes. It helps organizations manage their workforces efficiently in scheduling, time and attendance and absence tracking and clocking work time. 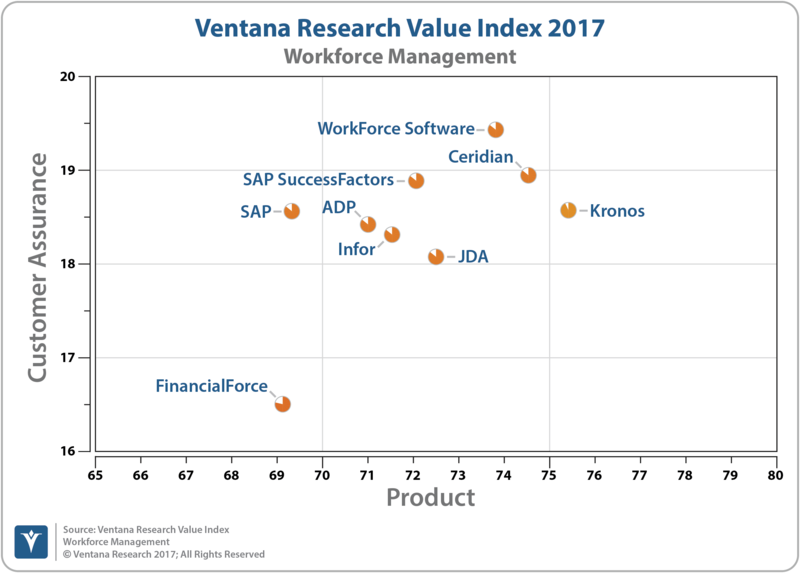 The technology vendors assessed in the 2017 Value Index for Workforce Management include: ADP, Ceridian, FinancialForce, Infor, JDA, Kronos, SAP, SAP SuccessFactors, WorkForce Software.